Can be used to teach about albedo. Educator may need to look further into albedo - open water also reflects and ice also absorbs, but it's the relative effect; also explore with students how albedo works. Educator may need to alleviate confusion about how aerosols are both reflecting and absorbing energy. Good visual of the radiative budget without any quantification of the effect of each of the factors. Because factors are not quantified, the graph stays current (publication date 2000). Comments from expert scientist: The paragraph provides a simple introduction to the direct cooling effects by aerosols and clouds. When considering direct radiative interactions of aerosols, in my view absorption of radiation by black carbon (and even brown carbon) and dust needs to be included too, so it will be a more complete picture if this slide also includes arrows for anthropogenic/natural aerosols that show solar absorption as well. 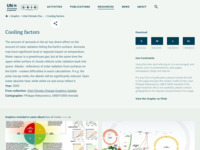 This visualization can act as the seed for a discussion of the effect of these various cooling factors on climate change. MS-C4.1: Systems may interact with other systems; they may have sub-systems and be a part of larger complex systems. MS-C4.3:Models are limited in that they only represent certain aspects of the system under study. HS-C4.4:Models can be used to predict the behavior of a system, but these predictions have limited precision and reliability due to the assumptions and approximations inherent in models.